Sudden Infant Death Syndrome, or SIDS, is every new parent's worst fear. The unexplained death of an infant under the age of one is a trauma that we wish no family ever knows. While this gallery discusses SIDS preventive tips, it is intended for informational purposes only. If you ever have concerns regarding your infant's health, please contact your healthcare provider immediately. Sudden Infant Death Syndrome, also known as SIDS, or “crib death,” is the unexplained death of an infant under the age of one. While there is no single known cause of SIDS, there are several measures you can take to prevent infant death. Taking care of yourself is the best way to give your baby a good start. Your first prenatal appointment should not be later than two months into the pregnancy. Taking your vitamins, eating good food, and watching your weight gain is a great way to help keep your blood pressure and blood sugars level during pregnancy. Even with diet and mild exercise, complications can happen, which is why keeping all of your prenatal appointments as scheduled by your doctor is vitally important. Smoking is a hard habit to break, but it’s the single best thing you can do for your baby, and yourself. Infants born to moms who smoked during pregnancy have a 60% higher chance of having low birth weight–a risk factor for SIDS. An estimated 20% of SIDS deaths could have been prevented simply by quitting smoking. The safest way for babies to sleep is on their back, on a firm mattress. The Back to Sleep campaign was started in 1994 in attempt to cut down on how many infants passed away due to SIDS. Since the campaign’s inception SIDS deaths in the US have declined by over 50%. Do whatever you can to prevent prematurity. Some medical complications cannot be avoided, but many can. Quit smoking, don’t drink or use illicit drugs, and have regular medical care. Some medical conditions such as diabetes and high blood pressure can increase your risk of preterm labor. Discuss your medical history with your doc before complications arise, and don’t be afraid to call your medical provider with any concerns. Preterm labor can be stalled, and even stopped–but only if you call your OB when you feel that something might not be right. Being a mom is hard. Being a teen mom can be even harder. Many factors in teenage motherhood can increase the risk of SIDS deaths. Lack of prenatal care, low income, lower rates of breastfeeding, and lack of support can all be reasons why the risk of SIDS deaths is so much higher in infants born to teen moms. The risk of SIDS is even greater for subsequent children if mom is still in her teens, so take extra caution with birth control. Getting pregnant too soon after delivery is hard on your body, and can negatively impact the health of your newborn. Your body needs time to recuperate and replenish itself after nine long months of growing a new person. Depleted maternal reserves could be one factor that causes the significant increase in SIDS risk when children are born close together. Waiting at least one year before getting pregnant again is recommended. Since SIDS deaths typically occur while an infant is sleeping, accidental suffocation is considered a possible culprit. 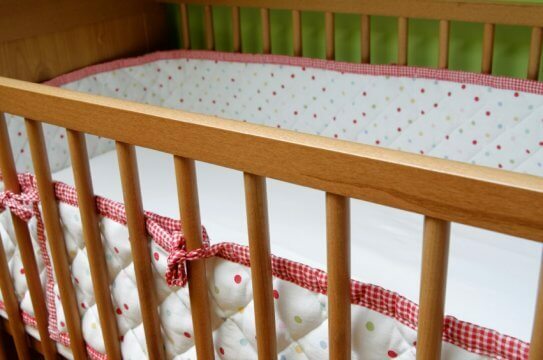 Infants should sleep on their backs in a crib free of any soft toys, blankets, pillows, or crib bumpers. Anything that can potentially limit, or obstruct, the airway is a danger and should be removed. Overheating is another possible culprit in SIDS deaths. Despite the fact that your grandma thinks your baby should have at least three layers of warm clothing, and a cap, keep your baby cool. Setting the thermostat to a temperature that you find comfortable, and then dressing baby in light clothing is the best way to prevent overheating. A blanket sleeper in winter, and a cotton onesie in summer is all baby needs. Recent research has shown that putting your baby to sleep with a pacifier can decrease the chance of SIDS by up to 90%! That’s something to cheer about. While there is some concern over the effects of long-term paci use on the alignment of a child’s teeth, stopping the pacifier after a year will help prevent cosmetic defects. As long as breastfeeding is firmly established, introducing a binky to naptime and nighttime is an easy way to help keep your baby safe.